Hallo! This was one my last pieces from 2017 that I uploaded on my Redbubble Shop! 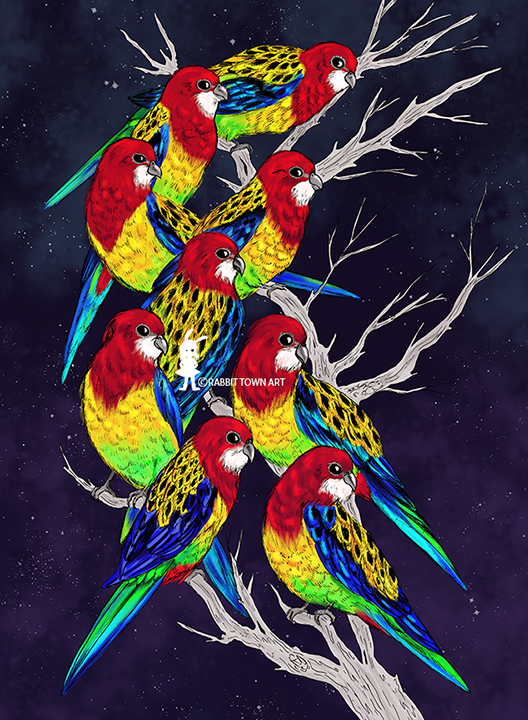 These are Eastern Rosellas, native birds to Australia. I really love them. It's not the first time I've drawn them either. I wonder if I should make the BG a little lighter? What do you think? I might do some adjustments and re-upload. Today was a fairly busy day but it's nothing but a warm up for tomorrow and next week for that matter. I wish I could say more....just a lot more stuff to deal with when you're higher up on the chain of command. Each project is a different beast and have their own advantages and weaknesses. I miss working from home. Juggling my time when travel is a factor makes things really hard. I am currently working on the same piece I started on Sunday. I finished inking all of it and it's now time to color in Photoshop!